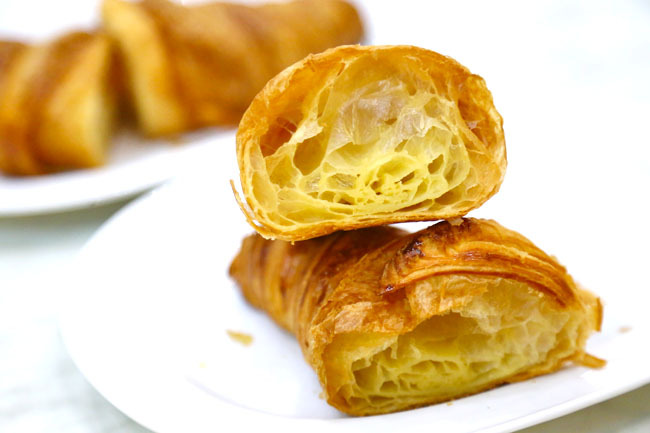 You might have noticed that the croissants at Délifrance in Singapore looked different, and prettier – a fuller longer shape, deeper golden brown exterior, more folds and seemingly more crisp. My observations over the shelves proved to be right. Délifrance did enhance their croissants. Délicieux! The Heritage Croissant was a surprise, but welcomed change. In short, it is tastier, crispier, fluffier and even healthier. The croissant’s quality was also proven, in a blind taste test by a panel of experts in the Superior Taste Award in which it won. 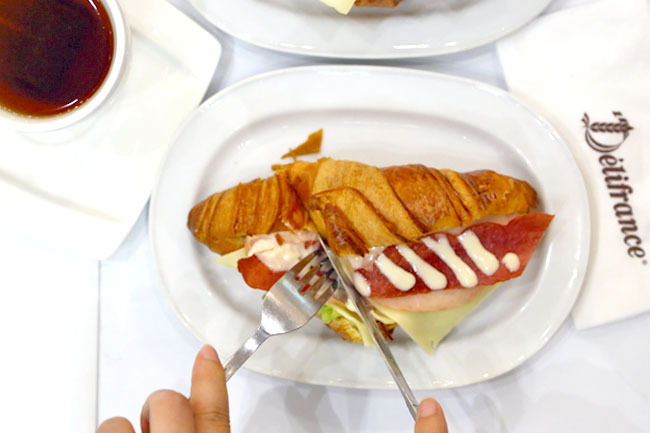 The Heritage Croissant also received three Golden Stars in the same award, the ONLY product in Singapore to score 90 marks and above. To put it to the taste test, I first ordered the plain Heritage Croissant ($2.50 introductory price, $2.90 regular price). Wait a minute, let us do a cross section cut across to see the inside. “Crunchhhhh….” Different already. By the look, touch and feel, you can already tell the exterior is crisper. The moment of truth. The inside also looked promising, layered with turns and folds, looking more airy than its predecessor. I thought that taste wise, the Heritage Croissant had a more buttery finish, soft sweeter savour. The truth is, not perfect yet, I won’t say it was the best best croissant I ever had, but definitely an improved version. To achieve the consistent quality of the croissants, they are said to be made from top quality French ingredients such as finely milled premium wheat flour from Grands Moulins de Paris, which contains higher dietary fibre and several vitamins, thus also healthier. There were also 4 other new products launched, 2 savouries and 2 sweets. (This is in order of my personal preference). The sweetness of the strawberries and smoothness of the cream cheese was a pleasant contrast to the crisp exterior of the Heritage Croissant. Is this dessert or what? I say this makes a suitable tea-time snack. Two words – gouda cheese. The cheese melted well, was soft, and milder in taste than the usual cheeses. 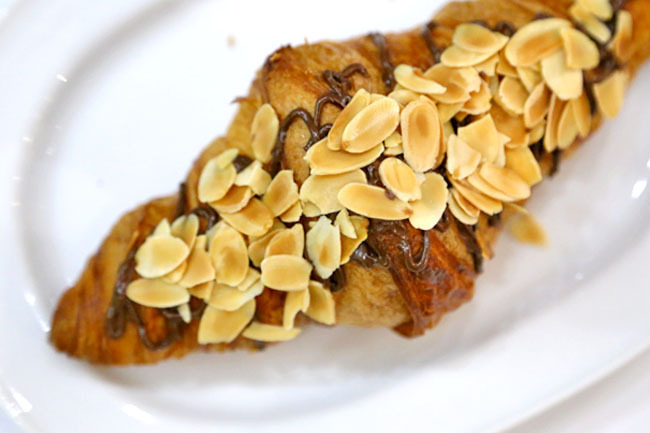 Chocolate with almond on croissant is always a good combination. Except that the chocoholic in me wished for more chocolate sauce! While this needed a little getting used to, you could appreciate the nutty crunch along with tender chicken pieces. 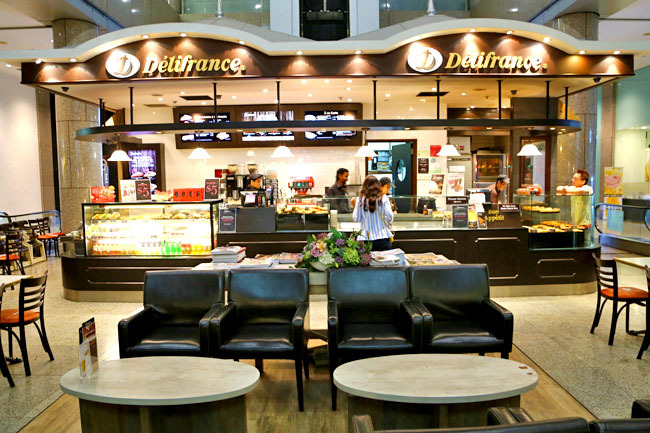 Délifrance will be rewarding 3 readers from DanielFoodDiary.com with $50 worth of Délifrance vouchers! 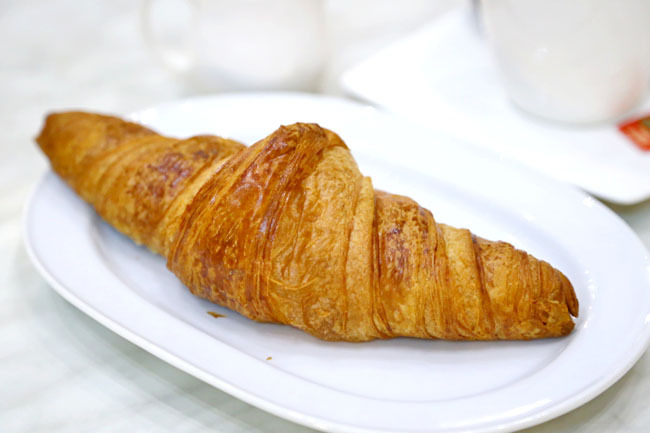 Step 3 – COMMENT below: Name Délifrance’s newest croissant. It’s that simple! * This entry is brought to you in partnership with Délifrance Singapore. Looks yummy… will definitely give it a try. Almond poulet sounds good because i love almonds! Cream Cheese with Strawberry Toppings Croissant! 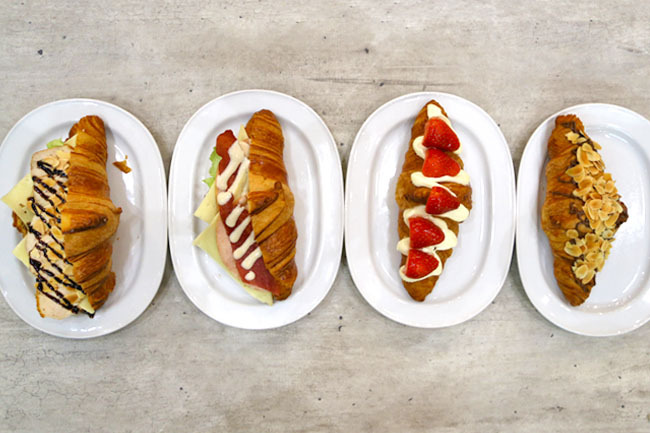 The four new crossiants are Heritage Croissant with Cream Cheese with Strawberry Toppings, Turkey Bacon & Chicken Ham, Hazelnut Chocolate with Almond Flakes & Almond Poulet. 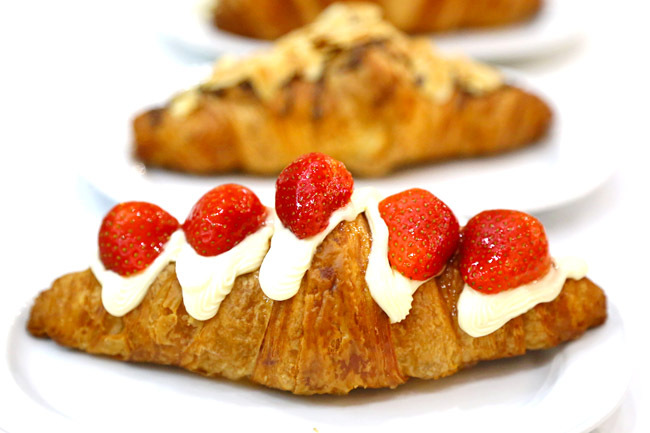 Cream Cheese With Strawberry Topping Croissant. 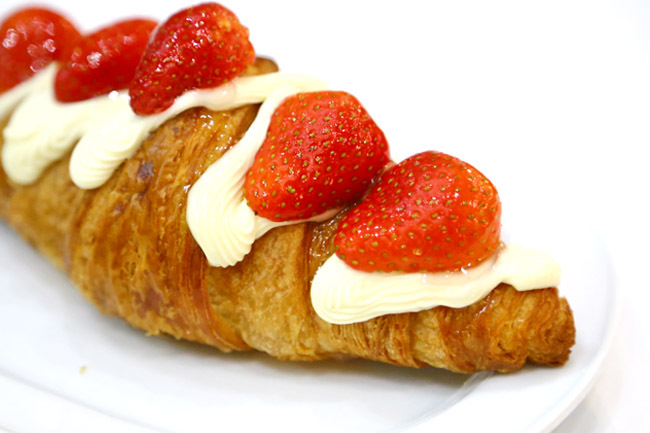 The newest Delifrance croissant is Cream Cheese With Strawberry Toppings !! Liked and shared Daniel's Food Diary and Delifrance Singapore page and post. Cream Cheese with Strawberry Toppings! Cream Cheese and Strawberry Toppings Croissant! still like to basic croissants.. can go with everthing u like.. Cream Cheese with Strawberry Toppings!! Heritage croissant!! my family is a big fan of delifrance, hope to win this yummilicious voucher for mummy dearest! 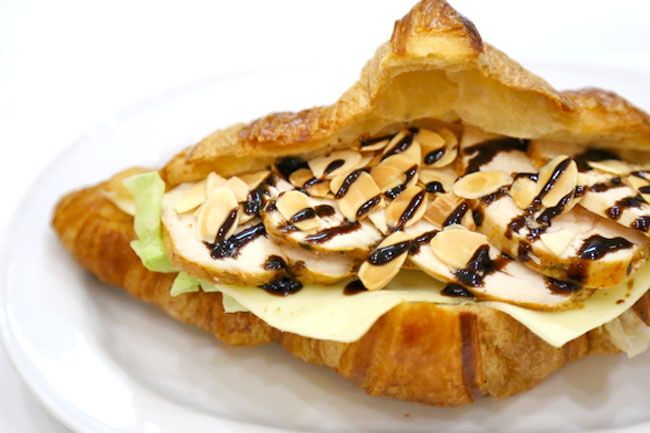 Delifrance newest creation is the Heritage croissant, as well as 4 other flavours: cream cheese with strawberry toppings, hazelnut chocolate and almond flakes, turkey bacon and chicken ham and almond poulet, all using the heritage croissant as base. HAZELNUT CHOCOLATE WITH ALMOND FLAKES! Two words – MUST TRY! Really enjoyed your blog posts which literally makes me drool every time! And thanks for this wonderful giveaway! Crossing my fingers in hope to win! It’s the Heritage Croissant that comes with 4 exciting flavours! Délifrance’s newest croissant is the Heritage Crossant. I love all the newest delifrance croissant with cream cheese with strawberry toppings and many more toppings . Love to win and try them all with my family and friends. Croissant at delifrance i love it soooo much. Délifrance’s newest croissant is the Heritage Croissant. I love chicken, I love almonds and I am very sure I will love this new creation,Almond Poulet. Thanks. I love the hazelnut chocolate with almond Flakes .It jsut look so yummylicious! The latest creation is cream cheese with strawberry toppings! Yummy!!! Heritage Croissant. Gosh I love croissants! Heritage croissant. Gosh I can’t wait to try. It's the Heritage Croissant! Passed by Delifrance at work today, and the Cream Cheese number had ruby red strawberries calling out to me! délicieux! The newest croissant is the Heritage Croissant! Awesome heritage croissant! I love delifrance esp their fruit tarts and croissants!!! The newest croissant is the Heritage Croissant. Four other types of croissants-2 savouries and 2 sweets were also launched. Newest croissant in Délifrance is the Heritage Croissant! Thank you for the chance to participate to win win! Cream Cheese with Strawberry Toppings is the newest Delifrance Singapore croissant! Délifrance’s newest croissant is the ‘Heritage Croissant’! The Heritage Croissant is the Délifrance’s newest croissant.. The Heritage Croissant! I love Delifrance croissants! Cream cheese with strawberry toppings croissant. Délifrance’s newest croissant is new Heritage Croissant – super buttery and fluffy!!! Good day kick start to a Crossaint treat! Heritage Croissant is their newest croissant! Name Délifrance’s newest croissant name is The Heritage Croissant!! Congrats to Ler Ler, Jennifer Yee and PeiWen Yui Tan for winning $50 worth of Délifrance vouchers from the DanielFoodDiary.com giveaway. Do email DanielFoodDiary@gmail.com before 12 Feb 2359 hours with your contact details. Enjoy your heritage croissants!